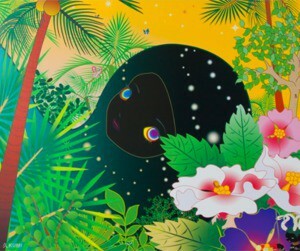 Chiho Aoshima is a CG artist who creates her unique and extraordinary world through manipulation of Bezier curves, a feature of the computer software Illustrator. She constructs her works with such elements as bodily fluids, reptiles, insects, and old, concrete buildings. Her works are audaciously enlarged and printed by heavy-duty printers, not only onto papers but also onto leather and plastic surfaces, giving her works the sense of transcendence of both art and illustration.